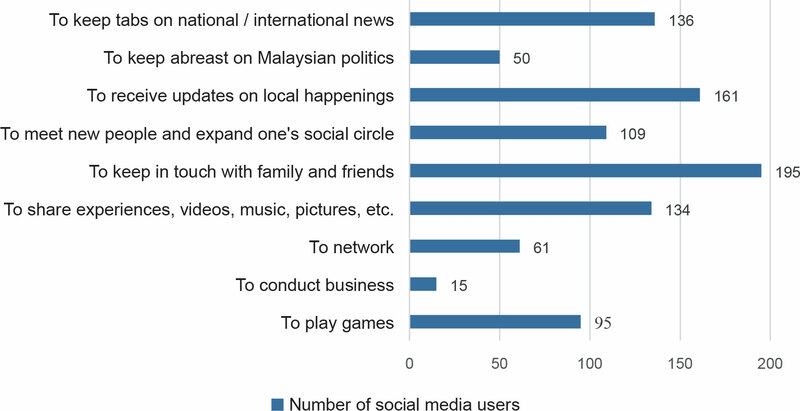 Social Media Usage among Penangites: A Tool of Benefit or Distraction? “Social media” is defined as any instance of electronic communication where netizens create online communities to disseminate information, videos, images or personal messages. Facebook is the most widely used social media platform in the world, with over 1.8 billion active users worldwide. Along with other social media platforms like Twitter, Instagram, YouTube, Google+ and LinkedIn, it has greatly altered the way information is created and distributed across the globe. Debates for and against the use of social media therefore becomes unavoidable as we gradually evolve in this age of digital revolution. Dr Calvin Newport, a millennial computer scientist and author of Deep Work: Rules for Focused Success in a Distracted World, asserts that social media platforms are not fundamental technologies, but rather entertainment products constructed to be an ecstasy for social media addicts, which at the same time extract information about users to be sold off to others for advertising purposes. To better understand certain aspects of social media usage among Penangites, a survey involving 270 respondents from three different age categories: i) under 20; ii) between 20 and 29; and iii) above 29 was conducted. The questionnaires were distributed virtually through Google Forms, as well as physically, covering as much ground as possible on both the island and mainland Penang including George Town, Bayan Baru, Air Itam, Bayan Lepas, Nibong Tebal, Butterworth, Bukit Mertajam and Simpang Ampat. Source: Author’s own calculations based on the survey conducted. Of the 270 respondents, 253 (93.70%) identify as social media users, with a majority of them spending at least two to 10 hours a day on their electronic devices. The remaining 17 however, feel that the handling of electronic devices and the maintenance of social media platforms are not only an arduous, time-consuming task, they also intrude on their privacy. A distinct trend is evident in which the respondents’ ages are inversely proportional to the likeliness of them being social media users as shown in Figure 1. The results above suggest that social media platforms are predominantly used to keep in touch with family and friends. Interestingly, only 15 out of the 253 social media users utilise these platforms to conduct business. Social Media – A Do or Don’t at Work? A total of 138 social media users (54.55%) concur that having access to social media platforms at work is a performance booster for several reasons. The sea of information from the World Wide Web not only provides seemingly unlimited data for research, business, marketing, etc., but it also connects the global network together with just a click of a button. The provision of social media micro-breaks likewise stimulates creativity and promotes work efficiency of both employers and employees. Figure 5: Does Allowing Employees Access to Social Media Platforms at Work Improve Their Performance? However, the remaining 115 users are of the opinion that the use of social media at work is a distraction. For example, excessive social media usage i.e., for entertainment purposes, may lead to underperformance at work. “Not many people are disciplined enough to separate between work and personal time,” says another user. Establishing effective work policies can therefore set early expectations that social media platforms are, for the most part, meant as tools to increase productivity. In turn, this will act as a solid foundation for the building of a good work culture in the future. Figure 6: Do Malaysians have Freedom of Speech over Social Media? Approximately 104 social media users believe Malaysians do not have the right to exercise free speech over social media, while 60 others remain uncertain – this makes up 65.05% of the survey’s total social media users. Interestingly, though most users age 20 and above believe this to be the case, those under 20 however differ in their opinions. It is possible that Malaysian netizens may be practicing self-censorship for fear of being detained under the Security Offences (Special Measures) Act 2012 (SOSMA) or the Sedition Act 1948. “This is apparent by all the arrests that have been made on the basis of unflattering opinions of the ruling coalition on Facebook,” says a user. Apart from three respondents who did not provide their opinions, 205 social media users (81.03%) believe that exercising free speech on social media platforms cautions them to be more mindful of their words and surroundings, while the remaining 45 (17.79%) hold a contrasting view on the matter; exercising free speech on social media will wrought political disharmony. Figure 7: Does Freedom of Speech over Social Media Cautions Us to Be More Mindful of Our Words and Surroundings or Does It Promote Political Disharmony? Transparency is a vital element of free speech, and it serves as one of the fundamentals in building a deep-rooted and trusting relationship between the state and its people. Figure 8: Are Social Media Platforms an Effective Way to Promote New Government Policies? With reference to Figure 8, Penangites are generally assured of social media platforms as competent tools for the dissemination of information regarding the latest government policies. But these platforms must equally double as channels for Malaysian netizens, be it in the country or abroad, to have their voices heard. A total of 199 users (78.66%) strongly agree that they should be provided with a platform on social media to voice their thoughts and opinions for when new government policies are being decided on. Returning to the topic of free speech, Malaysians are aware that their every action is being monitored by authorities, therefore making them susceptible to the risk of being investigated or even arrested. Despite this, 89 social media users (35.18%) still believe that they do have the ability to exercise free speech over social media, as shown in Figure 6. This allows social activists and a conglomeration of like-minded people to not only converge online, but to also enable the execution of their actions offline thus, translating a collective action into making real changes. Take Bersih for example, the campaign in Malaysia was so strongly supported by an international network of Malaysian diaspora through digital activism that during the Bersih 4 rally in 2015, Malaysians concurrently organised demonstrations in more than 90 cities worldwide. To that end, the sustainability of social activism is highly dependent on its social media engagement. Media platforms owned by the state are subjected to high levels of censorship – reflecting only positive governmental views – in the name of national security. As a result, social media may be one of the few avenues available for Malaysian citizens to freely express themselves. Almost half of the survey’s social media users (49.01%) express concern over the inadequacy of social media privacy policies in preventing privacy breaches among its users. To quote Apple’s CEO Tim Cook’s indirect reference of Facebook and Google, “some of the most prominent and successful companies have built their businesses by lulling their customers into complacency about their personal information” and “they are gobbling up everything they can learn about you and trying to monetise it.”  Platforms such as these rely heavily on advertising to users based on the data they amass from them for a portion, if not a majority, of their income. In Malaysia, government authorities are granted leeway to gather personal details of the rakyat for investigative purposes as the Personal Data Protection Act 2010 (PDPA) does not protect Malaysian citizens against governmental agencies and bodies. This not only allows authorities to obtain citizens’ private information without their knowledge and consent, their movements are being monitored as well. This demonstrates that the rakyat’s prerogatives to privacy are not always respected. So, one needs to ask how safe one is if a government official misinterprets data for misintention when in fact they may harbour no ill intent? Figure 9: Are Privacy Policies Effective on Social Media Platforms? Social media has proven to be an enabling tool for social, political, as well as economical action, and is by far the most pervasive technology in human history. But it has also given rise to a new form of oppression: cyberbullying. Masquerading: when a bully creates a fake identity of someone to harass others anonymously. Of the 253 social media users surveyed, 23 (9.09%) have had experiences with cyberbullying while surfing the Internet. As a matter of fact, CyberSecurity Malaysia’s statistics reveal that cyberbullying among students has risen to approximately 338 cases in 2016, an increase of 47 cases from 2014 – the figure is not surprising considering the fact that the number of social media users continues to rise by the day. But do these cases actually highlight the severity of cyberbullying in Malaysia? It is safe to assume that there are victims who are unwilling to come forward with their own traumatising experiences, and this may unfortunately lead to dire consequences. A case in point is 20-year-old Teh Wen Chun, a victim of cyberharassment, who took his own life by jumping off the 17th floor of a building last May after having endured anonymous online slandering. According to Ardy Ayadali, the publicity director of Befrienders KL, this is only one out of the many suicide cases that have occurred over the years. He adds that there is mounting evidence against social media as a provoker of suicidal tendencies among cyberbullying victims. Approximately 35% of victims who have reached out to the organisation are Gen Y-ers (especially those age 30 and under). They make up the majority of suicide cases in Malaysia. Befrienders chairman Mary Raj, however has a different take on the matter. She believes social media to be a readily available tool for those in distress to reach out for help; it allows victims the liberty to communicate their anxieties in an unpressured, non-judgemental manner. But then again, this may not be the case for all cyberbullying victims, as such actions may also result in a backlash from the online community who may view the victims’ actions as an attempt to seek attention rather than a plea for help, thereby further lowering the victim’s self-esteem, and putting him or her at even higher risk of committing suicide. Figure 11: Are You Aware of Laws Against Cyberbullying and Other Offences Committed over Social Media? Nevertheless, there are laws that have been enacted to help these victims. Figure 8 indicates that 178 social media users (70.36%) are aware of the laws against cyberbullying such as Computer Crimes Act 1997 and Communications and Multimedia Act 1998, while the remaining 75 users (29.64%) are not. It is inevitable that the number of social media users will continue to rise. To quote Bill Gates, “never before in history has innovation offered promise of so much to so many in so short a time.” Its impact will therefore continue to be more and more profound and, in many ways, unexpected. The benefits and the detrimental effects, especially on the young, need to be watched and studied persistently.